David Watkin walks up stairs to the seventh floor of his downtown condo. There’s no power to run the elevator, but he’s getting by. “I was born and grew up in a house with no indoor plumbing, no indoor washroom, no telephone. It&apos;s not that tough,” he said. 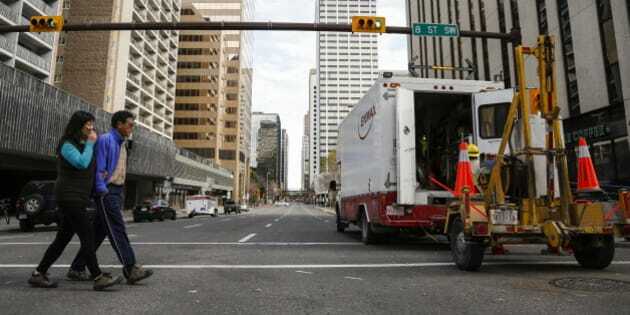 The weekend fire cut off power to 5,000 people and 2,100 businesses over several blocks in downtown Calgary. It’s not likely to be repaired until Thursday. Most are staying with friends and family, while city officials put up 450 in hotels overnight. But some are staying behind. Watkins, who lives on Sixth Avenue S.W., says he’ll eat sandwiches, but won’t be twiddling his thumbs in the dark. "I&apos;ve got a power block that I bought some time ago from Canadian Tire and you can run quite a few things off of it — a few lights, television." In the same building, Byron Henry rents out the unit he owns to a tenant, who insists on staying put during the outage. So Henry bought a barbecue and was putting it together Monday night so the tenant can cook on the balcony. But Francheska Rollo and her husband were packing to move into a hotel room. She says they can&apos;t stay with a baby. In a nearby building, Blair Alexander is sticking it out on the 13th floor. Although the lack of power means a loss of pressure and water supply to some high-floor units, Alexander has water. Some people showed up for work Tuesday, only to realize their offices were without electricity. Kumares Majumdar wasn’t sure if his building would be in the dark, so he headed to work to find a locked door and a note in the window. "They could not contact me on the phone. I went on the website and probably I did not see something specific about this tower," he said. Down the street, a few dozen students stood in front of their English language school, upset that the school didn’t contact them about the closure. Alberta Premier Jim Prentice described Calgarians as resilient over the weekend. This is the third major crisis the city has dealt with in recent years, with a freak snowstorm last month knocking out power to thousands and flooding in 2013 also impacting people in the downtown.